Corticosteroids are routinely utilized to alleviate edema in patients with intracranial lesions and are first-line agents to combat immune-related adverse events (irAEs) that arise with immune checkpoint blockade treatment. However, it is not known if or when corticosteroids can be administered without abrogating the efforts of immunotherapy. The purpose of this study was to evaluate the impact of dexamethasone on lymphocyte activation and proliferation during checkpoint blockade to provide guidance for corticosteroid use while immunotherapy is being implemented as a cancer treatment. Lymphocyte proliferation, differentiation, and cytokine production were evaluated during dexamethasone exposure. Human T cells were stimulated through CD3 ligation and co-stimulated either directly by CD28 ligation or by providing CD80, a shared ligand for CD28 and CTLA-4. CTLA-4 signaling was inhibited by antibody blockade using ipilimumab which has been approved for the treatment of several solid tumors. The in vivo effects of dexamethasone during checkpoint blockade were evaluated using the GL261 syngeneic mouse intracranial model, and immune populations were profiled by flow cytometry. Dexamethasone upregulated CTLA-4 mRNA and protein in CD4 and CD8 T cells and blocked CD28-mediated cell cycle entry and differentiation. Naïve T cells were most sensitive, leading to a decrease of the development of more differentiated subsets. Resistance to dexamethasone was conferred by blocking CTLA-4 or providing strong CD28 co-stimulation prior to dexamethasone exposure. CTLA-4 blockade increased IFNγ expression, but not IL-2, in stimulated human peripheral blood T cells exposed to dexamethasone. Finally, we found that CTLA-4 blockade partially rescued T cell numbers in mice bearing intracranial gliomas. CTLA-4 blockade was associated with increased IFNγ-producing tumor-infiltrating T cells and extended survival of dexamethasone-treated mice. Dexamethasone-mediated T cell suppression diminishes naïve T cell proliferation and differentiation by attenuating the CD28 co-stimulatory pathway. However, CTLA-4, but not PD-1 blockade can partially prevent some of the inhibitory effects of dexamethasone on the immune response. Immunotherapy is emerging as a promising anti-cancer treatment and is now part of the standard of care for certain advanced cancers including melanoma and non-small cell lung carcinoma . Encouraging results from recent studies suggest that intracranial lesions located beyond the blood-brain barrier may also be targeted by the immune system [2–5]. However, patients with intracranial lesions are frequently provided corticosteroids before commencing immunotherapy to combat cerebral edema and reduce symptom burden. Corticosteroids are also first-line agents against immune-related adverse events (irAEs) that may develop during or following immunotherapy, particularly checkpoint blockade [6, 7]. To date, it remains unclear how steroids impact adaptive anti-tumor immunity [8, 9], and whether the effects of corticosteroids on immune response differs if they are administered prior to initiation of immune therapy or after an immune response has been generated. Although a subset of patients receiving corticosteroids while undergoing treatment with immunce checkpoint inhibitors have achieved clinical benefit, there are concerns that they exhibit poorer response to checkpoint blockade [10–12]. Other studies found that corticosteroids do not negatively impact overall survival of patients on immunotherapy involving CTLA-4 blockade [13–18]. However, these studies were not powered to specifically address the impact of corticosteroids on immunotherapeutic response. Given the varied reports, the immunosuppressive effects of corticosteroids require further interrogation, particularly understanding the impact of this treatment when administered at the initiation of checkpoint blockade therapy, a situation likely to be common in patients with intracranial malignancies. Exogenous corticosteroids are toxic to immature T cells, including thymocytes and acute lymphoblastic leukemia blasts [19, 20]. However, less is known about the impact of corticosteroids on mature lymphocytes. Whereas corticosteroids have been shown to suppress IL-2-mediated T cell proliferation and cytokine production; they can also induce expression of the pro-survival receptor IL-7Rα [21, 22]. T cell reactivity against cytomegalovirus, a potential antigen in glioblastoma [23, 24], was not impaired in patients with glioblastoma actively receiving or previously on dexamethasone . Further, pre-operative corticosteroids did not reduce the density of tumor-infiltrating lymphocytes in patients with brain metastases . These observations suggest that antigen-stimulated memory T cells, a critical population for patients receiving immunotherapy, may be resistant to corticosteroid exposure. Here, we interrogated the impact of dexamethasone on T cell proliferation, differentiation, and cytokine production using human T cells and a murine glioblastoma model. We demonstrated that dexamethasone attenuates the CD28 co-stimulatory pathway by upregulating CTLA-4, thereby severely inhibiting naïve T cell proliferation and differentiation. This inhibition can be overcome in vivo by using a CTLA-4 neutralizing antibody, which extended survival in a murine syngeneic glioblastoma model. These findings have important implications for corticosteroid use with immune checkpoint blockade, particularly in patients with central nervous system tumors where corticosteroids are regularly utilized to mitigate peritumoral edema. Dynabeads® M-450 Tosylactivated beads (Invitrogen by Life Technologies) were coupled with 50 μg of protein according the manufacturer’s guidelines and as previously shown . Isotype beads were coupled with 10% Purified NA/LE Mouse IgG2a, k isotype control (BD Bioscience), 30% Ultra-LEAF Purified Mouse IgG1, k isotype control (Biolegend) and 60% Ultra-LEAF Purified Human IgG1 isotype control antibody (Biolegend). Stimulatory beads were designed using 5% Purified NA/LE Mouse anti-human CD3 (HIT3a; BD Biosciences), 30% Ultra-LEAF Purified Human IgG1 Isotype control antibody (Biolegend), 15% Ultra-LEAF Purified anti-human CD28 antibody (CD28.2; Biolegend) or Recombinant human B7–1/CD80-Fc Chimera Protein, CF (R&D Systems). Beads were stored in Ca2+ and Mg2+ free PBS with 0.1% BSA and 2 mM EDTA pH 7.4 at 4 °C. Healthy donor leukapheresis packs were obtained from the NIH blood bank (protocol 99-CC-0168). T cells were negatively selected using an EasySep Human T cell isolation kit (Stemcell Technologies) and cryopreserved in 90% FBS and 10% DMSO until use. Cells were thawed in a 37°C water bath and cultured overnight in RPMI1640 medium containing 10% fetal bovine serum, 1% penicillin-streptomycin-glutamine, 1% MEM non-essential amino acids solution, 15 mM HEPES, 1 mM sodium pyruvate and 55 μM 2-mercaptoethanol. Cells were plated at 1*105/200 μl in 96-well round-bottom plates with M-450 Tosylactivated beads. Dexamethasone was purchased from Sigma Aldrich (D4902) and dissolved in DMSO. Niviolumab and ipilimumab F(ab’)2 were used to block PD-1 and CTLA-4, respectively. Ipilimumab F(ab’)2 was created using a Pierce F(ab’)2 Preparation Kit per the manufacturer’s instructions (ThermoFisher Scientific, MA, USA). Cells were incubated at 37 °C in 20% O2, and 5% CO2 for four days for proliferation analyses and two days for Western blot and qPCR analyses. αCD152-PE (BNI), αCD8α-Pacific-Blue or Alexa 488 (RPA-T8), αCD4-APC (RPA-T4), αCD197-Brilliant Violet 605 (G043H7), and αCD45RO-Brilliant Violet 785(UCHL1) were purchased from BioLegend. Anti-CD4-Brilliant UV 496 (SK3) and anti-CD279-APC (clone EH12.2.2H7) were purchased from eBioscience. Cells were stained for 30 min at room temperature, rinsed with FACS buffer (1% BSA and 0.01% sodium azide in PBS), fixed with 4% paraformaldehyde (Alfa Aesar, WA, USA), and resuspended in FACS buffer for flow cytometry analysis. Cell Cycle analysis was conducted using a Click-iT® Edu Flow Cytometry Assay Kit (Invitrogen, Carlsbad, CA, USA) per the manufacturer’s instructions. Cell apoptosis was investigated using Annexin V-Pacific Blue (Biolegend, San Diego, CA, USA) and propidium iodide (Sigma Aldrich, MO, USA). Data were acquired on a BD LSR Fortessa SORP II or LSR Fortessa X50, analyzed with Flowjo version 9.9.4 and SPICE version 5.35. Isolated human T cells were collected after 48 h of stimulation and lysed in RIPA buffer with EDTA- free protease inhibitor cocktail set III (EMD Millipore, Billerica, Massachusetts, USA). Pierce BCA protein assay kit (Thermo Fisher Scientific, Rockford, IL, USA) was used to determine protein concentration. Samples were separated by SDS-PAGE (Bio-Rad) and transferred onto 0.2 μm pore size polyvinylidene fluoride membranes (PVDF) (Invitrogen, Carlsbad, CA, USA). The following antibodies were purchased from Cell Signaling: cleaved caspase 3 (5A1E), p27kip (2552 s), cyclin D3 (DCS22), CDK4 (D9G3E). Anti-CTLA-4 (EPR1476) was purchased from Abcam. The bands were detected by Super Signal West Pico chemiluminescence reagent (Pierce, Rockford, IL, USA). Antibodies against β-actin (AG74) or GAPDH (FL-335) were used as internal standards. Total RNA was extracted using Trizol reagent (Invitrogen). Reverse transcription was performed using the Superscript III First-Strand Synthesis System (Invitrogen) with oligo dT. Subsequent RT-PCR was performed using SYBR green reagent from ABI and run on an ABI Quant Studio7. β-actin was used as a control to normalize gene expression. Primers and conditions used for RT-PCR are listed in the table below. All experiments were approved by the NCI-Bethesda Animal Care and Use Committee. Six to 8 week-old female albino C57BL/6 mice were purchased from Jackson laboratories (Bar Harbor, ME). For intracranial tumor implantation, mice were injected with 1*103 GL261 cells that were stably transduced with a firefly luciferase-mCherry lentiviral vector. Water-soluble dexamethasone (D2915, Sigma Aldrich) was administered at 1 mg/kg/day by oral gavage. The non-toxic solubilizer, 2-hydroxypropyl-beta-cyclodextrin (H-107, Sigma Aldrich) was dissolved with water and matched in concentration to water-soluble dexamethasone for vehicle control. InvivoMab anti-mouse CTLA-4 (BE0131, BioXCell) or InVivoMab polyclonal Syrian hamster IgG isotype antibody (BE0087, BioXCell) were administered by intraperitoneal injection. Tumor was detected by luminescence imaging and analyzed with LivingImage Software. Statistical Analysis was performed using GraphPad Prism 7.0 software. Data are expressed as the mean +/− standard deviation and statistical significance evaluated by two-tailed Student’s t-test. P-values < 0.05 were considered significant. T cells require two signals for an effective proliferative response; the first signal arises when a T cell receptor (TCR) binds its cognate peptide:MHC complex, resulting in an intracellular signaling cascade through CD3. The second, co-stimulatory signal, is received when CD28 on T cells binds either CD80 or CD86 on antigen-presenting cells (APCs) . Here, T cells isolated from healthy donor peripheral blood samples were stimulated with an αCD3 antibody for signal 1 and either an αCD28 antibody or recombinant CD80 protein for co-stimulation . Recombinant CD80 permitted us to dissect the role of extracellular molecular interactions between CD80 and its multiple binding partners on T cells. These partners include the positive co-stimulatory molecule, CD28, and negative co-stimulatory molecules, such as CTLA-4 and PD-1. Human T cells incubated with αCD3 and CD80 underwent multiple rounds of division, demonstrating that recombinant CD80 provided an efficient co-stimulatory signal under normal culture conditions (Fig. 1a). However, dexamethasone exposure caused defects in cell division for both CD4 and CD8 T cells. Cell proliferation statistics, including precursor frequency, expansion index, and proliferation index, were performed on multiple heathy donor T cells isolated from peripheral blood mononuclear cells to assess population dynamics and identify the proliferation defect . Precursor frequency, defined as the cell-intrinsic probability that a cell will undergo at least one division, was diminished when T cells were exposed to dexamethasone (Fig. 1b). Similarly, dexamethasone-exposed T cells also had a reduced expansion index, a cell-extrinsic statistic used to express the fold expansion of the final cell count compared to the initial cell count (including undivided cells). Finally, the proliferation index, which represents the number of divisions that cells in the post-mitotic population have undergone, was modestly decreased by dexamethasone. Thus, cell proliferation statistics demonstrate that dexamethasone impaired the ability of CD80 co-stimulated CD4 and CD8 T cells to divide and restricted the expansion potential of these populations. In contrast, dexamethasone imposed only subtle cell division defects under all conditions in which CD28 was exclusively ligated with an αCD28 antibody (Additional file 1: Figure S1), indicating that direct ligation of CD28 can confer resistance to dexamethasone. Increased apoptosis and cell cycle blockade can each manifest as a proliferative defect in vitro. Dexamethasone did not increase the frequency of apoptotic T cells when cultured with αCD3 and either αCD28 or CD80 co-stimulation as demonstrated by flow cytometry and Western analysis of cleaved caspase 3 (Additional file 2: Figure S2), demonstrating that cell death was not responsible for the proliferative defect. Indeed, dexamethasone has been shown to protect T cells from activation-induced cell death . Cell cycle progression of CD80-costimulated T cells was next evaulated in response to dexamethasone exposure. Dexamethasone induced, on average, a 13% increase in the G0/G1 phase along with a 67% reduction of cells in S-phase and a 49% reduction in the G2/M phase (Fig. 1c). Dexamethasone-exposed T cells also contained increased levels of p27 protein, an inhibitor of cell cycle entry, and concurrent reductions in CDK4 and cyclin D3 protein. Together, these data demonstrate that dexamethasone blocks cell cycle entry in T cell stimulated with αCD3 and CD80. Following stimulation-induced expansion T cells may advance to a more terminally differentiated state. However, T cells cultured with dexamethasone had a greater proportion of naïve T cells (TN) and central memory T cells (TCM) and fewer effector memory T cells (TEM) than cells cultured with vehicle control after four days of stimulation (Additional file 3: Figure S3). Terminal effector T cells (TTE) were unchanged. These data indicate that dexamethasone blocked the ability of T cells to differentiate in response to αCD3/CD80 stimulation. The loss in TEM numbers was reversed by increasing concentrations of CD80 (Fig. 2 and Additional file 4: Figure S4), suggesting that strong co-stimulation may protect this subset from the inhibitory effects of dexamethasone. To directly test the impact of dexamethasone on T cell differentiation subsets, circulating T cells from healthy donors were sorted by flow cytometry into TN, TCM, and TEM subsets. The proliferative response of each was assessed in response to stimulation and exposure to vehicle or dexamethasone. Cultures from purified naïve CD4 and CD8 T cells were most severely impaired by dexamethasone, with a diminished precursor frequency, expansion index, and proliferation index (Fig. 3). In contrast, purified TCM response was comparable to vehicle control. TEM demonstrated reduced precursor frequency but greater cell number, suggesting that although dexamethasone impaired cell cycle entry, the cells were not lost due to apoptosis. Also, unlike TN, dexamethasone did not impair the expansion or proliferation index of TEM, demonstrating that this subset was less sensitive to dexamethasone than TN. CD80 provides a positive co-stimulatory signal to T cells when bound by CD28. However, following TCR signal transduction, CTLA-4 is translocated to the outer membrane of T cells where it can outcompete CD28 to bind CD80 and block co-stimulation [31–34]. Using flow cytometry, we confirmed that T cell stimulation led to increased extracellular CTLA-4 protein levels. In the presence of dexamethasone, however, stimulation caused a fourfold increase in surface CTLA-4 protein compared to vehicle treated (Fig. 4a) as well as an increase in CTLA-4 transcription (Fig. 4b). For these experiments, T cells were stimulated with αCD3 and αCD28 antibodies because surface CTLA-4 is internalized following ligation by CD80 , potentially impairing detection by flow cytometry antibodies. CTLA-4 expression was consistently found to be higher in CD4 T cells compared to CD8 T cells during dexamethasone treatment, likely rendering CD4 T cells more susceptible to cell cycle inhibition by checkpoint molecule. We hypothesized that dexamethasone-induced CTLA-4 upregulation on T cells out-competed CD28 for the shared CD80 ligand, thereby attenuating the CD28 co-stimulatory pathway and inhibiting cell cycle entry. To test this, CTLA-4 was blocked with ipilimumab, a monoclonal anti-CTLA-4 human antibody, thereby enhancing the ability of CD28 to bind CD80. With ipilimumab treatment, dexamethasone-induced cell proliferation defects were partially restored. Precursor frequency and expansion index of dexamethasone-treated CD4 and CD8 T cells were significantly increased (Fig. 4c) as well as the proliferation index of CD4 T cells. In contrast, the proliferation index of CD8 T cells co-stimulated with CD80 was not increased with ipilimumab. T cells exposed to dexamethasone also upregulated of PD-1 during in vitro stimulation, but blocking PD-1 with nivolumab did not significantly change T cell precursor frequency (Additional file 5: Figure S5). These data demonstrate that ipilimumab specifically reversed the proliferation defects caused by dexamethasone, implicating CTLA-4 as a mechanism for the anti-proliferative activities of dexamethasone exposure in T cells. The relative proportion of TN and TCM were increased in cultures exposed to dexamethasone compared to vehicle control. CTLA-4 blockade with ipilimumab led to an expansion of the TCM subset, and this was recapitulated in T cells cultured with the combination of ipilimumab and dexamethasone (Fig. 4d). Blocking CTLA-4 with ipilimumab increased IFNγ, but not IL-2 transcription during dexamethasone exposure, suggesting that CTLA-4 blockade may rescue IFNγ-producing T cells inhibited by dexamethasone (Fig. 4e). To determine if these findings translated to in vivo models, the C57Bl/6 syngeneic glioma tumor line GL261 was implanted intracranially. Consistent with the human in vitro data, dexamethasone increased the percentage of CTLA-4-expressing CD4 T cells of tumor-bearing mice in a dose-dependent manner (Fig. 5a). The percent of CTLA-4-expressing CD8 T cells also significantly increased in mice treated with the highest concentration of dexamethasone (2.5 mg/kg/day). Because dexamethasone upregulated CTLA-4, we hypothesized that CTLA-4 blockade would provide a survival advantage to dexamethasone-treated mice. GL261 tumor cells were implanted one week before commencement of dexamethasone or vehicle treatment to allow for immune surveillance and development of differentiated anti-tumor T cells. CTLA-4 blockade or isotype antibody were administered on days 13, 16, and 19 to vehicle or dexamethasone-treated mice to emulate the clinical scenerios where patients may be off or on corticosteroids before receiving immunotherapy (Fig. 5b). 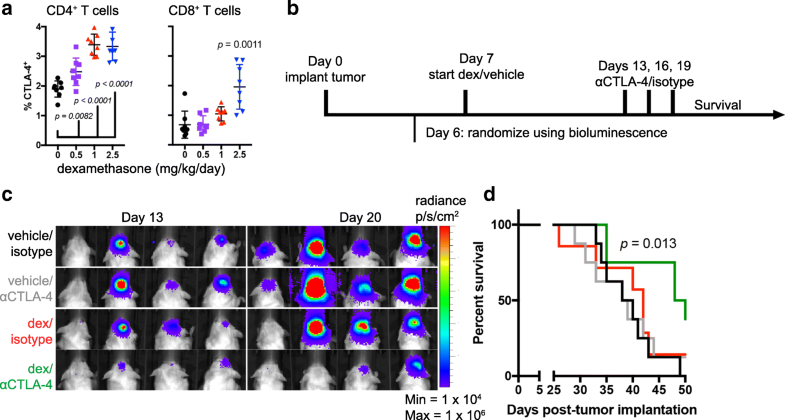 To ensure comparable tumor burden, mice were randomized into cohorts with equivalent tumor luminescence prior to treatment, and luminescence was measured weekly thereafter (Fig. 5c). Single-agent treatment with CTLA-4 blocking antibody or dexamethasone did not produce a significant survival benefit compared to vehicle-treated animals in this well-established glioblastoma model. However, mice that received CTLA-4 blockade in addition to dexamethasone treatment survived significantly longer than control animals, with a median survival of 49 versus 39 days, respectively (p = 0.013; Fig. 5d). Here, the immune system surveyed the immunogenic GL261 luciferase-mCherry tumor for one week before dexamethasone treatment was initiated. To determine if immune priming contributed to dexamethasone resistance, this experiment was repeated to include a cohort of mice exposed to dexamethasone one day prior to tumor implantation. In this cohort, CTLA-4 blockade did not provide a survival benefit (Additional file 6: Figure S6). These data indicate that dexamethasone exposure may block a successful anti-tumor immune response if treatment occurs before anti-tumor T cells can differentiate from the TN pool. The impact of dexamethasone exposure was next evaluated on lymphocyte populations from tumor-bearing mice, including tumor-infiltrating lymphocytes (TILs) and T cells in the tumor-draining cervical lymph nodes (TDLN). Mice exposed to dexamethasone possessed significantly reduced numbers of T cells in TDLNs. However, CTLA-4 blockade increased the total number of CD4 T cells in TDLN and CD8 TILs (Fig. 6a and b). The number of regulatory T cells (Treg) in the tumor-bearing brain were not significantly affected by dexamethasone or CTLA-4 blockade whereas overall numbers were reduced in TDLNs from each dexamethasone-treated cohort (Additional file 7: Figure S7A). Dexamethasone exposure reduced the total number of T cells in the majority of T cell subsets along the differentiation spectrum in the tumor-draining lymph nodes, yet as observed in vitro, this was partially rescued by CTLA-4 blockade (Fig. 6a and b). The number of CD4 TN and TCM TIL subsets were also significantly elevated by CTLA-4 blockade in the dexamethasone-treated group. The relative proportion of TCM TILs was increased by CTLA-4 blockade in both the vehicle and dexamethasone-treated cohorts (Fig. 6c). GBM has been reported to induce high expression of checkpoint molecules on TILs, resulting in a severe exhaustion signature . Dexamethasone treatment increased the percentage of CD8 TILs that expressed Tim-3 from 2 to 12%, although it did not significantly impact other checkpoint molecules (PD-1 or Lag-3) or the frequency of TILs expressing multiple checkpoint molecules (Additional file 7: Figure S7B). Although T cells expressing checkpoint molecules were less frequent in TDLN, dexamethasone decreased the frequency of most checkpoint-expressing T cells with the exception of Tim-3+ CD8 T cells, which increased from 1.5 to 7.5 and 1.3 to 4.7% in isotype and CTLA-4 blockade treated mice, respectively. Finally, the number of IFNγ-producing TILs in dexamethasone-treated mice was significantly increased with CTLA-4 blockade, consistent with in vitro data (Fig. 6d). 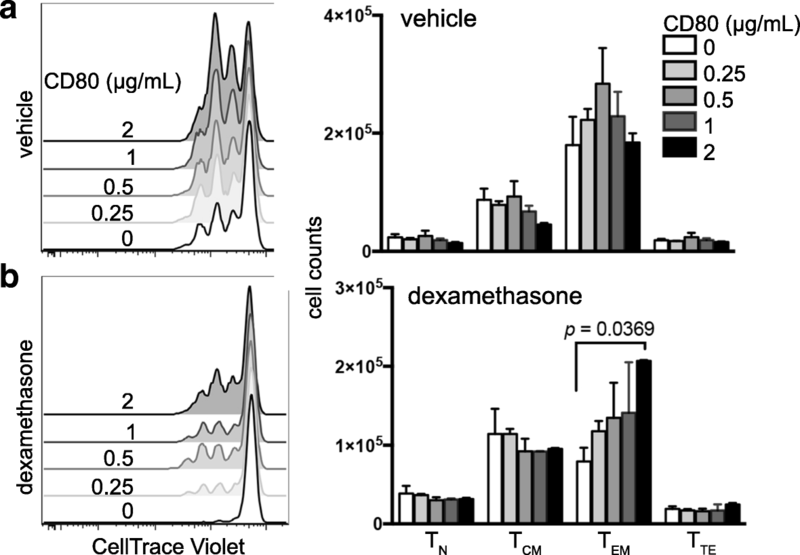 Together, these data demonstrate that CTLA-4 blockade can partially reverse the inhibitory effects of dexamethasone on T cells in vivo, reduce the proportion of TILs expressing checkpoint molecules, increase IFNγ-expressing TILs and extend survival of dexamethasone-treated mice bearing intracranial gliomas. Corticosteroids, most commonly dexamethasone, are regularly administered to patients with intracranial tumors to combat cerebral edema and provide symptomatic relief . Additionally, corticosteroids are used to treat patients who develop irAEs as a result of immunotherapy. In contrast to the frequent early use of dexamethasone for tumor-associated edema, corticosteroid use for immunotherapy-related toxicity is always given after treatment has commenced. Corticosteroids have been established as causing dose-related immunosuppression, yet the mechanisms behind this impaired immune function, particularly in the context of cancer immunotherapy, have not been defined . Importantly, it is not known if corticosteroids impede the differentiation of freshly stimulated T cells or if they deplete established and already differentiated tumor-reactive lymphocytes. In this study, the immunosuppressive effects of dexamethasone on individual T cell differentiation subsets were interrogated. TN were identified as being exceptionally sensitive to dexamethasone-mediated cell cycle blockade. TN are a key source of secondary anti-tumor immunity mediated by antigen spread in response to checkpoint blockade  and are highly sensitive to anergy imposed by expression of CTLA-4 . Dexamethasone exposure strongly upregulated PD-1 and CTLA-4 transcription and protein, consistent with previous in vitro murine studies [41, 42]. The data presented here extend upon these studies to demonstrate that dexamethasone-induced CTLA-4 upregulation effectively blocked TN proliferation and differentiation in both murine and human T lymphocytes. In tumor-bearing mice, this led to a loss of differentiated T cell subsets in several lymphoid tissues. In contrast to TN lymphocytes, dexamethasone exposure had much less impact on memory T cell proliferation following flow cytometry sorting. TEM had reduced precursor frequency but increased total numbers. Our data confirm and expand previous studies that demonstrated that the efficacy of TCR transgenic T cells was not impaired by dexamethasone treatment . Here, endogenously generated anti-tumor immunity could be maintained during dexamethasone treatment if CTLA-4 blockade was provided. Blocking CTLA-4, but not PD-1, partially rescued T cell proliferation in the presence of dexamethasone in vitro. These findings may reflect that CTLA-4 blockade acts upon less differentiated T cells, which are most sensitive to dexamethasone. 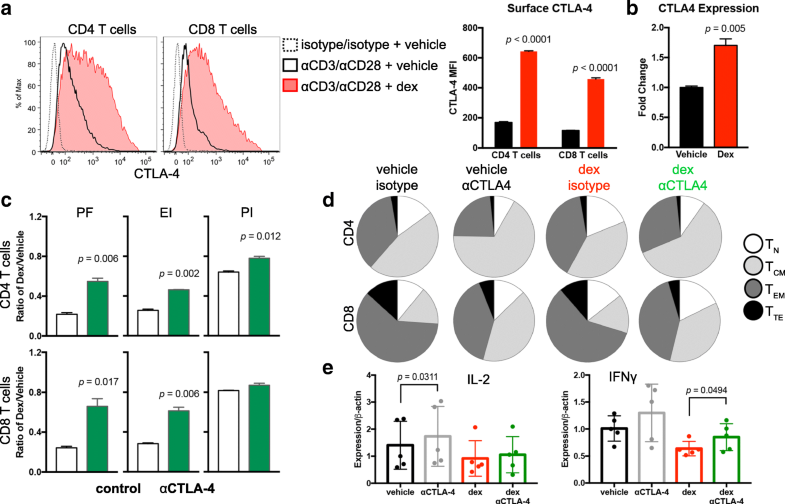 Systemic immunity elicited by CTLA-4 blockade has been previously shown to promote anti-tumor immunity against melanoma metastases within the central nervous system, indicating that CTLA-4 blockade functions outside of the CNS [15, 44]. The GL261 luciferase-mCherry tumor cells provided an immunogenic intracranial tumor model. By waiting one week before dexamethasone treatment, tumor surveillance and immune activation were permitted, potentially leading to differentiation of tumor-reactive T cells before dexamethasone exposure. In this model, CTLA-4 blockade was sufficient to provide a survival advantage to dexamethasone-treated mice. In contrast, mice exposed to dexamethasone prior to tumor implantation and antigen exposure were unresponsive to CTLA-4 blockade. Collectively, these data suggest that tipping the immune response to more differentiated subsets may lesson the immune suppression imposed by dexamethasone. These results demonstrate that the timing of dexamethasone treatment relative to the development of anti-tumor immunity significantly impacts the efficacy of immunotherapy. Previous work has shown that corticosteroids provided to alleviate irAEs did not impact the overall response rate of patients with melanoma who received nivolumab . For those patients, corticosteroids were provided after immunotherapy was initiated. In contrast, patients with intracranial tumors are routinely provided high-dose corticosteroids from the period of initial diagnosis until chemoradiation completion, a period that can span 8–12 weeks. Corticosteroids are also provided during surgical resection, as they have been shown to extend survival in this context . Thus, for patients with intracranial tumors, corticosteroids provided before initiation of immunotherapy, a time when the immune system is unlikely to be actively proliferating, may blunt the generation of an anti-tumor response. Similarly, dexamethasone provided to immunologically “cold” tumors or those with insufficient anti-tumor immunity will likely abrogate new priming and differentiation of anti-tumor T cells. However, the concurrent use of CTLA-4 blockade can encourage TN activation, thereby contributing to antigen spread. Once anti-tumor immunity has been initiated, the negative impact of corticosteroids on immune function is markedly reduced. These results may have important implications in designing future immunotherapy strategies helping to optimize clinical trials for patients with brain cancers as well as other diseases where corticosteroid use is common. Steroid alternatives may need to be considered for patients with intracranial tumors who wish to enroll on immunotherapy trials. For example, blockade of vascular endothelial growth factor by bevacizumab reduces edema by normalizing tumor vasculature. Further, it has been shown to promote lymphocyte infiltration into the tumor and increase circulating memory T cell numbers . Such alternative approaches may be needed to manage symptoms in patients with intracranial tumors while preserving the potential for anti-tumor immunity. Here, we interrogated the impact of dexamethasone on T cell subsets in the setting of immunotherapy. Dexamethasone blocks naïve T cell proliferation and differentiation by attenuating CD28 co-stimulation. Because co-stimulation is essential for successful T cell priming and expansion, these data suggest that corticosteroids impair response in immunotherapy treatment-naïve patients or those with poorly antigenic tumors. However, T cells may be partially protected or rescued from the immunosuppressive effects of dexamethasone with administration of CTLA-4 blockade. Additionally, negative corticosteroid effects are diminished after developing a successful anti-tumor immune response. The authors wish to acknowledge Jonathan D. Ashwell, M.D. for insightful scientific discussions. This research was supported in part by the Intramural Research Program of the NIH, NCI. AJG designed research studies, conducted experiments, acquired and analyzed data, and wrote the manuscript. MH designed research studies, conducted experiments, acquired and analyzed data. HMS, JJ, NR, CMR, WZ, HS, RB, and DD conducted experiments, acquired and analyzed data. PEF contributed data and edited the manuscript. DMP designed research studies, provided reagents, and edited the manuscript. MRG designed research studies, analyzed data, and helped write the manuscript. All authors read and approved the final manuscript. Not applicable; not a clinical trial. Woroniecka K, Chongsathidkiet P, Rhodin KE, Kemeny HR, Dechant CA, Farber SH, et al. T Cell Exhaustion Signatures Vary with Tumor Type and are Severe in Glioblastoma. Clin Cancer Res. 2018; https://doi.org/10.1158/1078-0432.CCR-17-1846. Gulley JL, Madan RA, Pachynski R, Mulders P, Sheikh NA, Trager J, et al. Role of antigen spread and distinctive characteristics of immunotherapy in Cancer treatment. J Natl Cancer Inst. 2017;109(4) https://doi.org/10.1093/jnci/djw261. Xing K, Gu B, Zhang P, Wu X. Dexamethasone enhances programmed cell death 1 (PD-1) expression during T cell activation: an insight into the optimum application of glucocorticoids in anti-cancer therapy. BMC Immunol. 2015;16(39) https://doi.org/10.1186/s12865-015-0103-2.